At the University of Kentucky, we have a distinctive, compelling story. Steered by our land grant mission, we educate our students and prepare them to—not only succeed in their careers—but to invent the careers of the future. We serve and heal communities across the Commonwealth, declaring that stubborn, insidious diseases can be prevented or cured. And we develop a broader understanding of our world, in Kentucky and beyond. It’s a story we tell with pride. Yesterday afternoon, we celebrated a chapter in our shared progress—in which our faculty and graduate students illustrate each of these commitments. Stephen Dobson, professor of medical and veterinary entomology in the Department of Entomology, College of Agriculture, Food and Environment, and his former graduate student, Jimmy Mains have developed a technology that uses male mosquitoes to effectively sterilize females through a naturally occurring bacterium. While most mosquito control companies use chemical pesticides sprayed out of planes or trucks, MosquitoMate is very different. Rather than using chemicals, it is based on the idea of using a natural bacterium called Wolbachia. MosquitoMate Inc breeds sterile male mosquitoes that serve, themselves, as a nontoxic, non-GMO pesticide. Unlike female mosquitoes, male mosquitoes do not bite. Since female mosquitoes tend to be monogamous, once a sterile male mosquito mates with a female, her eggs will not hatch. This eliminates the next generation. President Capilouto joined the MosquitoMate team yesterday to celebrate the opening of a new facility—an expansion that will create new jobs and bolster their important work. At capacity, the new facility will be able to produce, per week, an excess of 50 million eggs and 3 million sterile males. The approach is poised for EPA approval. 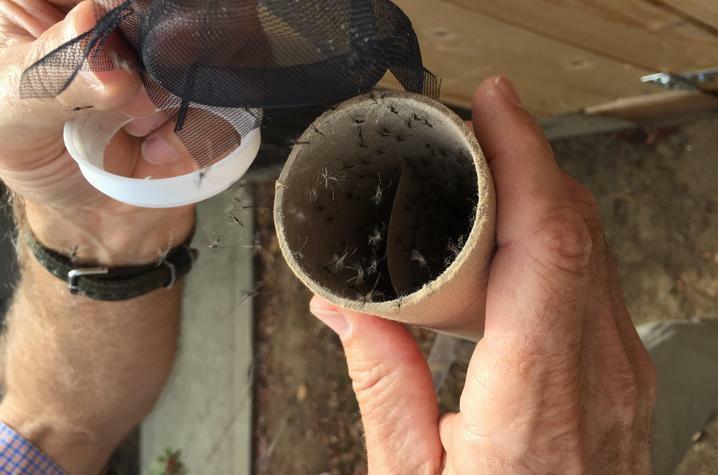 Once approved, they will be able to sell the sterile male mosquitoes to combat pest control issues. So, as the world confronts the dangers of diseases transmitted by mosquitos—maladies like Zika, Yellow Fever and Malaria, to name a few—this work may hold a key to unlocking solutions, in an environmentally responsible way. That’s the power of an advanced research enterprise, dedicated to addressing complex challenges and enriching peoples’ lives. And, as MosquitoMate demonstrates, the work of our researchers has a powerful impact on our community, state economy, and the industries their leadership helps shape. In 2014, an independent study concluded that UK’s research enterprise – fueled by competitive grants and contracts – had an economic impact exceeding $580 million annually, and affecting more than 8,000 jobs, and $21 million in state and local taxes. Those numbers give us great pride. However, when I talk about our research impact, I like to share more than statistics. I tell people our stories. Stories like the work occurring at MosquitoMate: ground-breaking innovation, discovered through partnership, used to improve the lives of those we touch. It’s a compelling story. It’s one I’m honored and excited to share. Learn more about MosquitoMate here.